In the interview during the Holy Father’s flight to England, one reporter wanted to know what could be done to make the Church more “attractive.” The bemused pope replied: “A church which seeks above all to be attractive would already be on the wrong path, because the Church does not work for itself, does not work to increase its numbers so as to have more power. The Church is at the service of Another.” That is well said. The great French medievalist, Rémi Brague, was asked in an interview about the scientists who claim that “supernaturalism is based on ignorance.” Brague replied: “Such statements are hopelessly muddled. At the bottom of all that, you find Auguste Comte’s idea that religion can’t explain the world as well as science does. This is very true. But whoever said that explaining the world is what religion is about? The fact that we know more and more things about nature does not prove that there is nothing else than nature.” The real issue is: Why is it that we have a power to know anything at all, including nature? 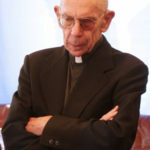 My old classmate, Father Michael Saso, told me that several Jesuits have been able to teach courses in Christology or Church history in Chinese Universities that they would not be allowed to teach at UCLA or Michigan. The late Father Richard Neuhaus used to speak of the “Catholic moment,” or at least the missing of it. Somehow, in the back of our minds, we think that finally the scholarly world will come to see the enormous sense and intelligence in Catholicism, “the range of reason,” as Maritain called it. It probably won’t happen, not because this intelligence and good sense are not there, but because of the humility it would take to think modernity through in terms of Catholic orthodoxy, the delicate compatibility of reason and revelation. If we have a model here of how this might be done, it has to be Chesterton. These comments are entitled “Confident Catholicism.” We used to hear of a Catholic vice called “triumphalism,” actually a pretty good word, as H. W. Crocker, in Triumph, showed. In recent years, I have been struck by the remarkably high quality of study in all fields that can be traced to the Catholic mind. Much of this, more immediately, has to do with the School of Philosophy at the Catholic University of America. But ultimately, I suspect we owe it to the enormous scope of the minds of John Paul II and Benedict XVI. George Weigel, in his wonderful new book on John Paul II, remarks, as others have, that ironically, today, the leading defender of reason in the modern world is nothing other than the papacy. Thus, Brague: “We should endeavor to get a clearer picture of the reasons why Christians – and not only the pope – have to speak up from time to time. They don’t preach their own stuff, pro domo. They warn of dangers that menace mankind at large, and they have to do so when they think that some behavior, be it individual or collective, is lethal for mankind. The supreme rule in those matters is some sort of duty to rescue.” The duty to “rescue” the mind of man is indeed a great mission of Catholicism. In saving souls, minds too are saved. I have been long of the opinion that the great aberrations of the world first begin in the turmoil in the minds of the intellectual and clerical dons. They have little to do initially with the condition of the world such aberrations seek to change in the name of a higher humanist good. In 1 Timothy 4, we read: “The Spirit distinctly says that in latter times some will turn away from the faith and will heed deceitful spirits and things taught by demons through plausible liars – men with seared consciences….” Our world often seems full of “plausible liars.” “Seared consciences” are in the daily news. The fact is, though, Catholicism is confident. It knows about sin and its effects, so it is not overly surprised to meet them, especially among its own. That is the whole point of redemption. But there is an order in things; they do fit together. Almost every day this becomes clearer. The suspicion that it might just be true is the real root of hatred for Catholicism in the modern world.